Our reviewer in… Maysa Moncao wants you to get your questions across to to stars and big wigs at September’s Toronto International Film Festival. The Toronto International Film Festival (TIFF) is the leading public film festival in the world, bringing the power of film to life each September, since 1976. TIFF helps audiences discover a diverse array of films, including the best in international cinema, the latest homegrown Canadian talent, Hollywood galas and everything in between. Last year’s line-up included: The Imitation Game, starring Benedict Cumberbatch, Maps to the Stars by David Cronemberg, and Une Nouvelle Amie by François Ozon. This year TIFF is nearly 40 years old. I am planning to cover it and you’ll be there with me, via Twitter. I will be the link between you and your most beloved star or filmmaker. Usually, film reviewers are concerned about the films that will hit the season, or are trying to find the next Hollywood promise. I have covered festivals in Rome, Venice, New York and London and I noticed that there is still a gap between audience and critics. How come if social media helps to connect us all? If you support my project to go to TIFF, my commitment is to bring to you the red carpet and press conferences. I will be updating you daily via www.cinesocialuk.com and @73f 301beb5b54c6 and you’ll be able to send your questions to me. Believe me, I can do it. I got the last question among 200 journalists at the press conference of Fury. 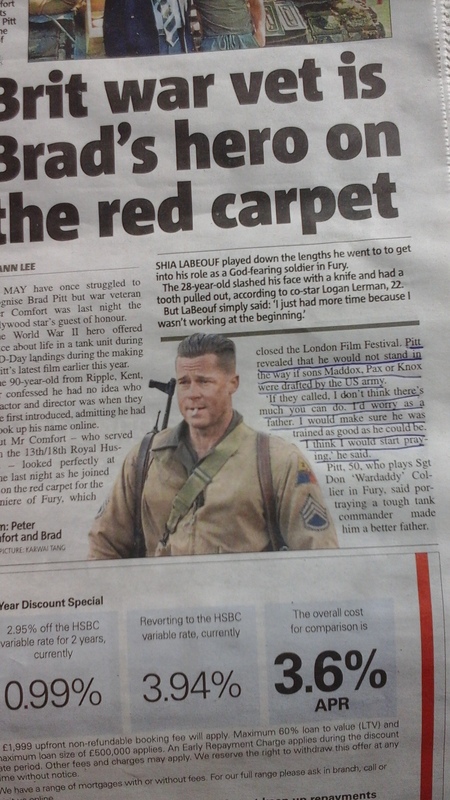 Brad Pitt stuttered an answer to it! The following day it was published everywhere, even in The Metro newspaper (honest! ).